The smaller implants used with a partial knee replacement surgery are customized to the patient's anatomy based upon CT scans of the patient's knee. A surgical Robotic Arm assists the surgeon with preoperative planning and intraoperative component placement, positioning, and alignment. 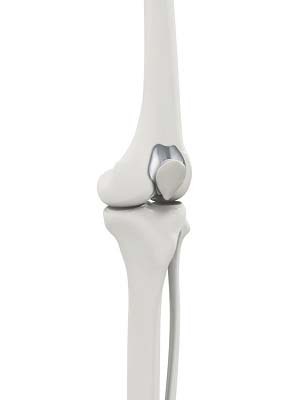 Patellofemoral Knee Arthroplasty surgery will not alter the ability of the patient to eventually move to a Total Knee Replacement in the future should that become necessary. Infection: Infection can occur with any operation. In the knee this can be superficial or deep. Infection rates are approximately 1%. If it occurs, it can be treated with antibiotics but may require further surgery.